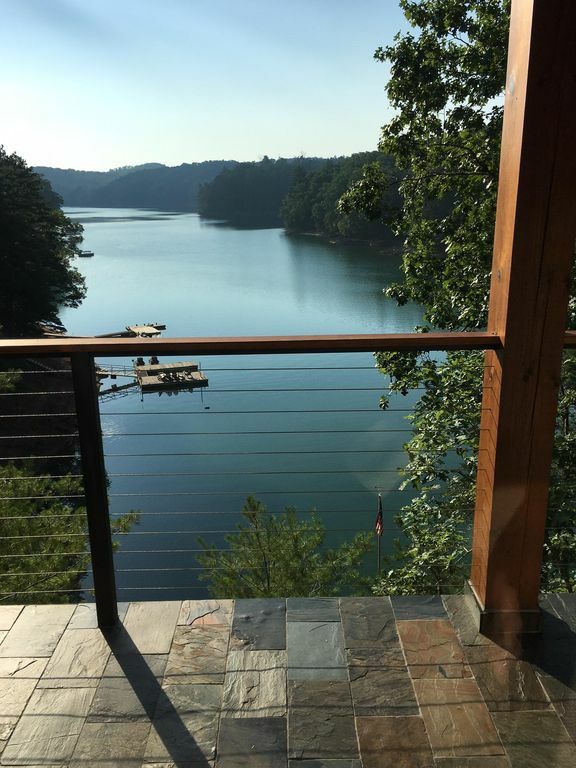 Sleepy Hollow Mountain Lake Retreat is a beautiful New custom-built vacation rental home on Lake Hiwassee in the Bear Paw Community of Murphy, NC. Our family has planned and worked hard for 10 years to make this a dream come true for our family and yours to have comfort and luxury like nowhere else in the community. The views are breath-taking from every room! When you walk in the front door, you will wonder if you are in a luxury resort or a treehouse. The entire floor has windows with views of the woods, the mountains and best of all, right down the main channel of the lake. Unlike many other rentals on Lake Hiwassee our property has water year round. So bring your boat no matter what time of year. This homes main level is an open floor plan concept for entertaining and congregating for plenty of room for larger groups. The chef kitchen has all high-end appliances with a huge island for prep, seating and entertaining. The dining room table seats 10. The great room has large comfy sofas, club chairs and has a game table and chairs. The fireplace is a real wood burning Rumford style fireplace that warms the whole room! The lake views from here are amazing. The water is so close you feel like you can touch it. The house sleeps 10 in beds. There are 3 master en suites on the upper level with lake views from every room. The master suite has a full length covered porch, king bed, sitting area, and full bath with shower. The second suite has a small covered porch, queen bed, and full bath with shower. The third suite has lake views, queen bed and full bath with tub/shower combo. On the lower level the fourth bedroom has a full bed and 2 twin beds and adjacent full bath with tub/shower combo. The upper level also has a coffee bar! In the morning you can make your tea or coffee and enjoy the morning sun rising behind the house on to the lake with the babbling creek next door for the perfect Ahhhhhh morning. There is also a beverage cooler when you are ready to wind down in the evening and enjoy the sunset behind the house onto the lake from the master deck. We call this Heaven. The lower level is the recreation area. There is a full length covered deck, ping pong table, theater room with 3D projector for DVD movies, kitchen area with full size frig and separate ice maker plus bedroom and full bath. You also have easy access to the lake and private dock just a few steps away with diving board, kayak and chairs waiting for you. Sleepy Hollow Mountain Lake Retreat is the perfect vacation! Whether you need a couples getaway, a family reunion, gather your friends with kids, just the girls or just the guys, or a business retreat, we have everything for your comfort including high-speed WiFi and satellite TV. Recently added to the property are Google Minis. These help to increase the speed and internet coverage in a larger home, like this one, and for homes in a more remote area, like ours. We are pleased to offer this extra feature, and hope it helps improve the service during your stay. UNLIMITED HOT WATER SO YOU CAN TAKE 4 SHOWERS AT THE SAME TIME!!!! Community Features Available: Tennis, Pool, Volleyball, Fishing Pond and Basketball. Concert Summer Series (must purchase tickets in advance) check-out "Bear Paw Live" on the communities website. New Marina store now offers with basic items you might have forgotten, like sunscreen, toothbrushes, bug spray etc. Just 2 hours from Atlanta, Chattanooga, Knoxville and Asheville. Only 40 minutes to the new Harrah’s Cherokee Valley River Casino. 40 minutes to new Breweries in Cooperhill, as well as shops and restaurants. Or even take a train ride. Blue Ridge GA is 45 minutes from the property and has more shopping breweries and excellent variety of local restaurants. a paint your own pottery studio for a rainy day idea. There is also an Apple Orchard, Merciers Orchard with seasonal apple and berry picking. Hiking, River Rafting, Mountain Biking and Fishing are other outdoor activities 30-50 minute drive from the property. Or you can book your own fishing guide services on Hiwassee or in Blue Ridge you can schedule a trout guide on the Toccoa River. Boat Rentals available at the local Mountain View Marina in-side Bear Paw Community. Town car driving services to Copperhill, The Casino, and Blue Ridge are available in the area. We are the Songer family! I'm Sheree (the oldest) and i have 3 brothers - Mark, Brent and Shane. Our dad, Jerry, is our hero, our biggest cheerleader and never-failing comforter and inspiration. Our mom, Jane, is in heaven. Her motto was "Family is Forever" and although she's not here now, she kept us together - then and now. We currently live in Chattanooga (the boys), north Atlanta (me) and Macon (Dad). I'm geographically in the middle so i can keep everyone on task :-) Together with our extended family, we have been blessed. Not the kind of blessed that comes from ease but blessed in the hard. We find the grace and love and purpose. God is good. We are Family. It all started with a dream... More than ten years ago Mark and Brent stumbled onto Bear Paw looking for lake property close to home and they fell in love. We had no idea it was possible to find a place on a lake, in the mountains and not crowded - almost vacant even. And we've found since then that very few other STILL now about it! So Dad, Mark and Brent bought this lot and waited for "someday" when they could build a family dream house. In the meantime, we have vacationed at Bear Paw and never grown tired of this little piece of heaven. And finally in 2015 our whole family combined our expertise, resources and affirmations (that's my part) to build this beautiful retreat looking down the channel of Lake Hiwassee! Now we are SO grateful and SO excited to share our dream with YOU. I'm personally so proud of Brent's patience and perseverance to make this dream come true. It was not easy. Finding Joy in the Journey evading us many times along the way. Still we had the ability to do together what none of us could have done alone. We opened for business in September 2016 about a year behind schedule but worth it! Now this beautiful luxury vacation "dream" home is available for everyone to enjoy this little piece of heaven - Mountains & Lake | Luxury & Comfort | Relaxation & Recreation - with your friends and family! The best thing about Sleepy Hollow is the space and the views. when you walk in the front door you feel the peace and calm of being away from the "real world". It's time to enjoy time with family and friends without all the work. The first thing everyone says the first time is "Wow! The pictures don't do it justice.". And it's true. Because pictures can't capture the feeling of inhaling the good and exhaling the bad. Sleepy Hollow is special. There is room to spread out and to be together at the same time. You have privacy or community. You can enjoy the lake or the mountains. You can take a quiet walk or get in the kayak to remember who you are and where you're going. Then you can get loud and play together and laugh and enjoy each other like we don't have any worries. Everything about Sleepy Hollow was designed for family - yours and ours! *UNLIMITED HOT WATER, 4 SHOWERS AT SAME TIME!!! * The main level bath/laundry is accessed from the front entry adjacent to the kitchen. It features a half bath with combination stacked front-loading washer and dryer. * The 3 upper level full bathrooms are accessible through private bedrooms only. * The lower level full bathroom is accessible to the lower bunk room and theater room kitchen. It is behind the bedroom for privacy but also available to the lower level. Very Cute Historic Downtown Murphy has local coffee shops, wine bar, live music, groceries, shops, and micro brew pub and Harrah's Cherokee Valley River Casino. Spectacular views of Lake Hiwassee from every room. In the summer the water is so close you feel like you can dive in from the deck but don't! In the winter months the water level drops to expose beautiful rock formations along the shoreline. Lake Hiwassee is surrounded by the Nantahala and Cherokee National Forests. 3 Land line phones with free local and long distance calls is provided on each level (828-644-9613). The kitchen phone has a voice message center for receiving messages when you are out. There are 2 high efficiency HVAC systems. One for the main and lower level and one for the upper bedroom level. 2 sets of bed linens are provided for each bed along with blankets, pillows and comforters. Stacked GE high-efficiency front load washer is available on the main level. Laundry detergent is not provided. Use HE detergent only. Stacked GE front load dryer is available on the main level. The main level great room has a beautiful stacked stone fireplace for amazing all wood fires. We provide firewood but you may want to bring fire starters for convience. The fastest DSL wi-fi available is provided by Frontier Communications. The main level TV is smart tv and connected to wi-fi. Bring you Netflix account to order movies. Bath towels are provided for indoor use only. Towels for lake use are not provided. The main level great room views are breath-taking. Enjoy a fire or TV on the 2 full sofas or 2 club chairs or go out on the deck to enjoy the great outdoors. Jenn-Air Induction Cooktop offers precise temperature control and heats up quickly. Energy transfers heat directly to cookware, while the surface remains cool to the touch. In the main kitchen there is single-cup Keurig and 10-cup brewing coffee makers. The upper level coffee bar has a Keurig and the lower level kitchen has a 10-cup coffee maker. No food items are provided. One roll of paper towels is provided along with 2 dishwasher pods. The kitchen is fully stocked for large parties or small. There are dishes and glassware for every occasion to serve 12. Pots, pans, baking sheets, bowls and utensils of every kind and grilling tools. The gourmet chef's kitchen is on the main level and features high-end appliances, a large center island and plenty of storage space and accessible to the main deck with a gas grill. The dining area is open to the kitchen and great room with views in every direction. The 10' buffet is perfect for serving or storing The long farm table seats 12. The main level features as 60" HD wifi-enabled TV with DVD player. The lower level game room has a 55" HDTV. The theater room with 3D projector, surround sound and 9'x5' movie screen for DVD movies. The main level and game room TVs have DirecTV satellite service. The theater projector is for movies only and does not access the satellite. Bose stereo receiver is on the main level. A whole house sound system will be installed during 2017. The main level TV features a blu-ray DVD player. The theater room has a 3D/BluRay DVD player. A large variety of books and magazines are available. The game room features a ping pong table, bar stools and Big Joe Milano bean bag chairs. The ping pong table can be folded and moved aside for open floor space for sleeping or playing. A large variety of board games and puzzles are provided. There is a large variety of DVD movies. No video game system or video games are provided. There are 4 decks to enjoy the lake from every level. The Master Suite, Queen Suite 1 and lower level each have covered deck. The main deck off the great room and kitchen is open. A single-man kayak is provided on the dock. The dock is in the water year-round. A boat is not provided but you can bring your own boat and keep in at the dock steps away from the house. Boat rentals are also available at the marina. The dock is in the water year-round. Sleepy Hollow Vacation Retreat is not wheel chair accessible at this time. Bear Paw Community has a beautiful pool available to all guests. We loved our stay at Sleepy Hollow. The house was cleaned and well decorated, the views of the lake at sunshine were incredible. I was so happy that the house had gates for the stairs, having a small people around, gave us piece of mind. If you forgot to bring any grocery, be prepare for a long drive to the store, and if you really need internet, be prepared the wifi connection is not reliable, but other than that we all enjoyed having our meals at the big dinning table, playing ping pong and a walk by the river. Will definetely come back! So glad you all had a wonderful time celebrating the new year! I'm sorry to hear the wifi was a problem. We have the best option available in the area so we do not have problems. We depend on that! I will definitely check on it. Please stay with us again anytime! you walk in and feel right at home! have muscles... this place is three stories and no elevators... and soooo you got to muscle up and carry them to your room! furniture and bedding was crazy great! We gathered a group of friends and stayed for a weekend which was not enough time to enjoy this lovely home. We all agreed the contemporary feel of the home was a refreshing change from typical mountain cabins. We loved the open main floor which was great for conversations around the island and still included those that had their feet up by the fire. So many decks! While the changing season is beautiful, we want to come back when we can use the dock. Wonderful, well-appointed house made for entertaining! The property was laid out fantastic! There was enough space for everyone without being on top of each other. The views were awesome as well. We will definitely be back soon for another weekend getaway! We absolutely loved our stay at Sleepy Hollow. This was our first visit to Lake Hiwassee, and we hope to return many times. Our boys have already requested that we make this a tradition. Sleepy Hollow is a hidden gem on a beautiful, peaceful cove. The kids (and adults) enjoyed jumping off the dock, and swimming in the private cove. We rented a pontoon boat for 2 days and went exploring, tubing, fishing, and swimming all around the lake. We spent hours boating and only saw a handful of other boats each day. We felt like we had the lake to ourselves. The house is beautiful, with stunning views from all decks. Star-gazing at night was breath taking! We had plenty of room for our party of 8 (3 adults, 5 kids), and the house has every amenity you could possibly need. We enjoyed having a ping pong tournament on our final night! Our kids are between ages 7-12, and the bunk room, game room, and theatre were perfect for them. And of course, they loved the dock and diving board. Thank you, Sheree and family, for sharing your beautiful home with us. This trip and family time were much needed, and we had the best time at Sleepy Hollow! Thanks Jessica! Come back soon! The accommodations met all of our needs. The views from the house were breathtaking! We fished, kayaked, and enjoyed swimming in the lake. Definitely would recommend Sleep Hollow Retreat to others. Bear Paw Community is in a remote area of Lake Hiwassee outside of Murphy NC. Murphy is a 20 mile/30 minute drive from Sleepy Hollow and offers shopping, restaurants, bars, coffee shops, banks, grocery and gas. Murphy is also home to the new Harrah's Cherokee Valley River Casino (40 mins). Check the calendar for available dates. Contact us if you have any questions! thanks!